Mitch McConnell’s empty fiscal threats: Debt ceiling, sequester, and shutdown. Mitch McConnell wants the next fiscal deal to be all cuts, no taxes. But he has no leverage. 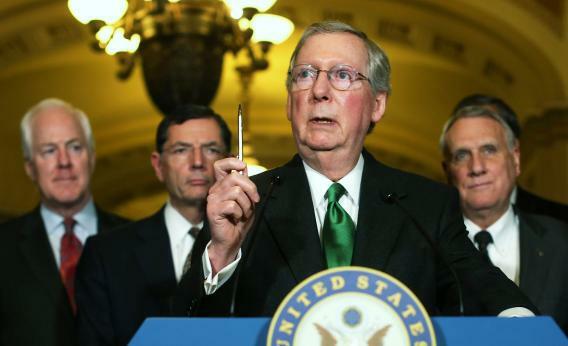 Mitch McConnell, flanked by Senate Republicans, discussing the fiscal cliff on Dec. 4, 2012. Mitch McConnell, the Senate Republican leader, wants Democrats to cut a lot of federal spending without raising any more taxes. Unfortunately, his party just lost the presidential election, failed to capture the Senate, and doesn’t have enough support in polls or the business community to shut down the government or refuse to raise the national debt ceiling, which would trigger a default and another credit downgrade. So what does McConnell offer in lieu of clout? A lot of bluffing. 1. Leverage. “It’s a shame that we have to use whatever leverage we have in Congress to get the president to deal with” overspending, McConnell said on Meet the Press. On Face the Nation, he was asked whether he’d support House Speaker John Boehner’s demand for $1 in spending cuts for every $1 in debt-limit increase. McConnell retreated to the same timid language: “We have to use whatever leverage we have. And there are some examples of leverage coming along. The debt ceiling is one of them that hopefully would get the president engaged.” Whatever leverage we have? Hopefully? Engaged? That isn’t how you talk when you have leverage. It’s how you talk when you know your leverage is fake. Republicans don’t have enough members willing to tank our credit rating or shut down the government. They know it would be too painful. 2. Opportunities. “We have a few opportunities here in the next few months, presented to us by … the debt ceiling, by the sequester kicking in two months from now, by the continuing resolution to operate the government—plenty of opportunities to generate that discussion” about spending cuts, McConnell asserted. On This Week, he pledged to seize “any opportunity we have to engage the other side in a discussion about quitting the spending spree.” Opportunities? To generate discussion? That’s not an issuance of demands and deadlines. It’s a plea. 3. Elected to lead. McConnell expressed dismay that President Obama, “elected to lead the country, is so reluctant to engage” on spending: “We elected the president to be president. It’s time for him to step up to the plate and lead us” to cut spending. Remember when Republicans said Obama’s defeat would be a mandate to enact their agenda? Now they’re saying his re-election confers a duty to enact their agenda. 4. Stop campaigning. “We know he’s good at campaigning,” McConnell said of Obama, “but when does he put the campaign aside and start governing and addressing the single biggest issue?” This is a modified version of the “elected” ruse. McConnell spent four years trying to make spending cuts versus tax hikes a lethal campaign issue against Obama. Having lost that referendum, McConnell now thinks the president is civically obliged to forget the electorate’s verdict and “govern” more like a Republican. What we did was prevent tax increases on 99 percent of the American public. Nobody in the Senate, not the 90 percent of Senate Republicans who voted for this, voted to raise anybody’s taxes. And the arbiter of whether something is a tax increase or not is Americans for Tax Reform. The head of Americans for Tax Reform said it was not a tax increase. … This was not a tax increase. I feel bad for McConnell. He’s right that our debt is too high and our entitlement programs are out of control. He’s right that we need to means-test these programs and raise the ages of eligibility. But the debt-ceiling and sequester deadlines won’t force us to make those cuts any more than the fiscal cliff did. Politically, those deadlines are empty threats. Republicans will have to bargain for entitlement cuts, and that will mean swallowing tax hikes. If that wasn’t obvious before McConnell’s interviews, it is now.